It’s no coincidence that Acer’s Predator Thronos Gaming Chair has a name that’s similar to that of an evil, world-killing villain from Marvel lore. It’s just as titanic in nature as Thanos, wielding three monitors and a tower desktop. Unveiled at the IFA 2018 convention in Berlin, this isn’t just a chair: It’s also a titan. Measuring nearly five feet tall, the throne-like Predator Thronos is made of steel and sports a two-tone color scheme: Black with illuminated white accents or black with lit blue accents. It resembles something ripped straight out of science-fiction, providing a “cabin” that reclines up to 140 degrees. Inside is a vibrating chair that reacts to your on-screen action, along with a comfy foot rest. Slung over your head like a metallic scorpion’s tail is a brace that holds three 27-inch displays – sold separately – in front of your face. 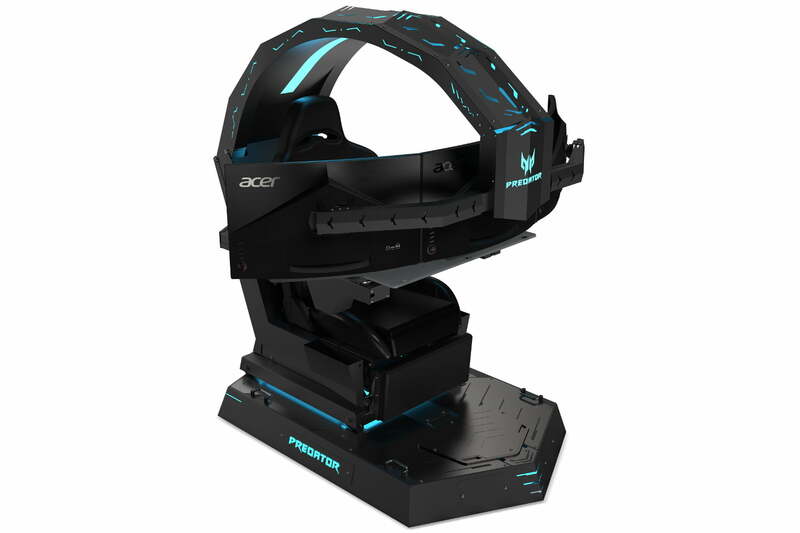 This brace appears to be illuminated by multiple variants of the Acer Predator logo stretching out along the top, sides and bottom. 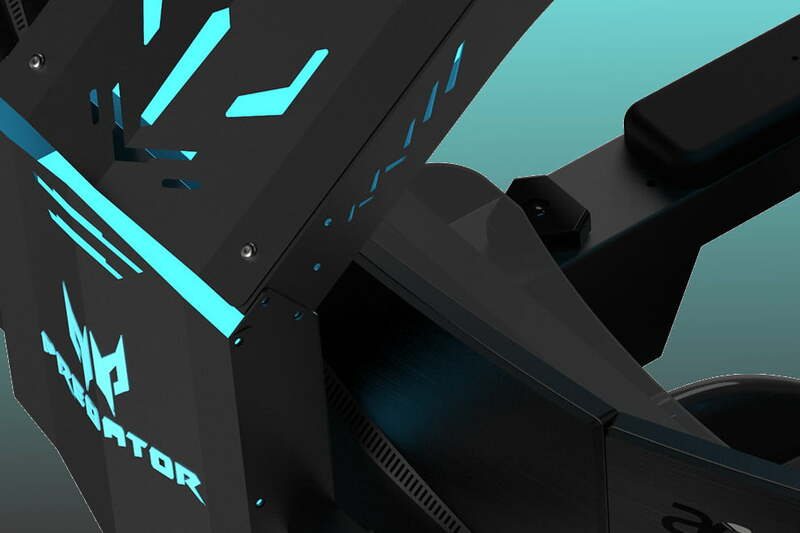 The piece joining the two monitor support rails to the overhead brace includes the full, illuminated Predator logo. But there’s more to the Predator Thronos than just the chair and monitor rails. Everything sits on a huge metallic base complete with illuminated “Predator” wording, illuminated accents and backlighting creeping out from under the chair. There are two handles mounted on each side of the base, so you can drag this huge metallic beast to your favorite spot. So where do you place the desktop? The provided images stemming from the show don’t offer any clues save for a possible area behind your back on the other side of the steel support. An Acer representative told Digital Trends that your desktop – if it’s the correct size – can fit in a compartment under your chair. If it doesn’t fit, then it merely sits on the floor at the right side of the Predator Thronos. We presume this beast provides means for cable routing so you’re not tripping over cables while getting in and out of the chair. 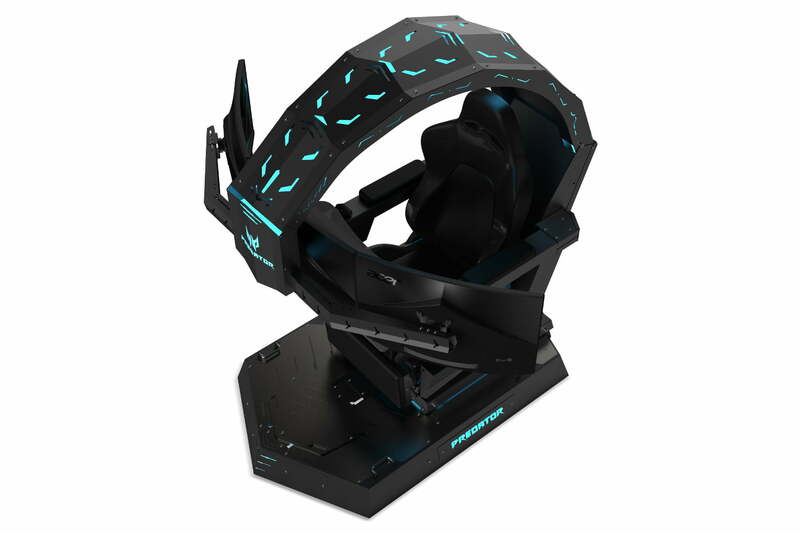 The Predator Thronos is what you could consider as an “extreme” upgrade to the company’s Gaming Chair. This version consists of premium PVC leather, an ergonomic “body-contouring” design, a detachable headrest, lumbar cushions, and adjustable armrests with a 180-degree recline. The chair is mostly black save for a blue highlight that snakes around the front edge of the cushions. At the time of publication, Acer didn’t say when the Predator Thronos would arrive or how much it will cost. Chances are that it may arrive in the fourth quarter of 2018, along with the company’s other new gaming products introduced during the show. These include new monitors and peripherals based on the Predator and Nitro brands.